We’ve been blessed to have a workshop and a place to build in our home, in each home we’ve lived in. We know that’s not the case for everyone, but having a few tools you can whip out and get started with is something everyone can do! 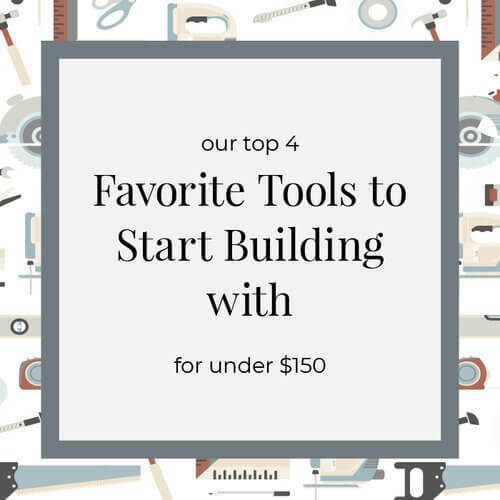 If you’re willing to pick a small project and get these few tools you’ll be on your way to building your own furniture in no time! If you're curious about my entire shop of tools you can go here and see what all we've got, but for today lets talk about these 4 important ones. Keep in mind, having a large tool collection didn’t come quickly or easily for us. To be honest, there have been many trips out of town to get larger tools off of craigslist for a better price, searching online, and reading reviews online. But, we’ve built some really amazing friendships at local tool and hardware stores along the way and continue to grow in our skills as designers and builders. A drill or impact driver can be used with interchangeable bits to drill holes or screw screws into wood and other surfaces such as drywall, metal, and tile (depending on the bit). The impact driver has more torque and uses quick change bits, it is the lighter weight of the two as well. A standard drill shrinks or expands its hole size to accept bits of different sizes. If you have to choose just one, get the impact driver. You won’t be sorry! Direct Tools (my favorite place to get tools) has reconditioned ones for $50. We recently bought a second set of them since my husband kept stealing mine for his truck work. A Pocket Hole Jig (most common brand of these is Kreg) is for drilling holes at a special angle with a special bit for the purpose of joining two pieces of wood together. It’s very simple to use. Both the Jig itself and the drill bit adjust to the thickness of wood you’re joining. You simply clamp the jig down and drill your holes. You can find these at Lowes, Home Depot, Woodcraft, or even on Kreg’s site and it’s $40 for their smallest unit. They have a smaller sized one for $20 and larger one for around $100 too, but I’ve survived about 5 years with my R3 unit the medium sized one and it’s still going strong. widths of boards. It can also bevel/tilt side to side as well as twist left to right to cut angles and miters. You can also get one reconditioned for about $100 online. I got my original one for under $100 from a pawn store locally. A circular saw is a hand held electric saw often used in place of a table saw or miter saw when space is limited or mobility is an issue. It is typically used to cut larger sheet goods or square up the end of a board. To square the board means to cut it at perfect 90 degrees so that you have a straight end to then measure and make more cuts from. You can find a reconditioned one for only $50 online. I've got a popular post on the differences between these too also. SketchUp, which used to be owned by Google but now owned by Trimble, is a 3d modeling program for not just architectural and design professions, as it’s well known for, but also for DIYers and anyone wanting to build a model of something before actually building it. You can also use it to do simpler tasks such as rearranging a room in your house. There is a 3D warehouse where other users have uploaded their designs, such a furniture, decor items, to whole houses, to save you time. The free version, which is all I’ve ever used, is called SketchUp Make, and a paid version with additional features and functions, is called SketchUp Pro. SketchUp is Free to use and simple to learn. Get started today! If you’re willing to invest under $150 in these tools, and invest in yourself, knowing you can do it, then in no time you can be drawing up something you want to make and then with the tools listed above you can actually get started making something, instead of just pinning a bunch of stuff to your online boards. You can do this, I'm confident of it. If I can, you can, your belief in yourself is half the battle!